Approximately 70% of all children killed or injured by motor vehicles are struck within blocks from their own homes (dlyklh.com). 74% of pedestrian fatalities among children 14-and-younger occurred at non-intersection locations (dlyklh.com). In 2015, 5376 pedestrians were killed in traffic crashes and 70,000 were injured in the United States (NHTSA). 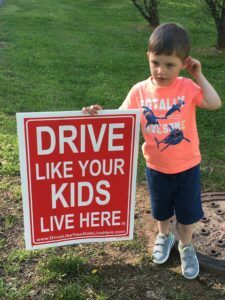 To help keep Grove Park residents and pets from becoming part of the above statistics, Lindsey is spearheading bringing “Drive Like Your Kids Live Here” yard signs to Grove Park. When you see these signs begin to appear in private yards in the neighborhood, please check your speed and, if you’re going too fast, slow down. The speed limit in Grove Park is 25 MPH. We want everyone and every pet to get home safely! If you missed the opportunity to purchase a sign during this campaign, it’s not too late. Individual signs can be purchased at local Home Depot stores, or online at www.dlyklh.com.